The Sandmaster 2000 takes sand containing 6% moisture, and discharges dry sand up to 250° - 300° F, at an approximate rate of one ton per hour. It is capable of processing over one ton per hour at lower moisture levels by simply adjusting the unit. 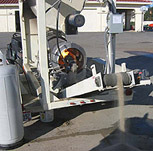 Uses only 2-3 gallons of LP gas per ton of sand at an effective cost of $4.00 - $5.00 per ton of sand dried. 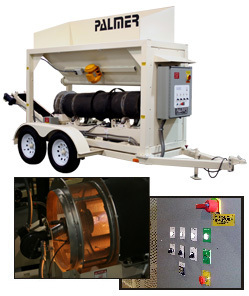 The Palmer Sandmaster not only reduces these costs, but also processes the sand better. By drying at higher temperatures, it eliminates disease pathogens along with weed seed to produce a truly sanitized topdressing. “Superintendents will enjoy managing their sand-use better while reducing sand drying costs and producing a homogeneous particle-sized topdressing,” said Palmer. about it in this recent testimonial. Dry sand when you need it…where you need it. Topdressing your greens – easily with the sand of your choice. No need to purchase expensive bagged sand or unsightly storage silos. Dried sand works its way into the turf canopy – easily & faster. Reduce or eliminate downtime due to waiting on sand to dry before working it into the turf. With optional trailer mount, SANDMASTER 2000 can be used anywhere on your course. Screens out undesirable over-sized particles. Produces more consistent topdressing sand. Screen your bunker sands for foreign materials. Mix sand, seed, or organize matter together. to 250˚ up to 300˚ F to sanitize. Reduces the viability of weed seeds. Reduces the potential of disease pathogens. Reduces fines in the sand, burns off unwanted material and blows off fines. Shown with safety guards in place for personal safety and protection during transportation..
Warranty by Palmer Manufacturing with over 30 years of industrial equipment fabrication experience. Will custom design the SANDMASTER 2000 to meet your tonnage requirements. Easy operations, CE approved, safety guards complete cover unit. See an example of the Palmer Sandmaster 2000 in action, and what one golf course has to say about it in this recent testimonial.